I can honestly say that I never expected to bring another furry family member into my home anytime in the near future. Living in only a small apartment and already having a medium sized dog and a rambunctious cat keeping my hands full, adoption was the last thing on my mind … until Stevie came along! From the moment Stevie entered the animal clinic where I am employed, I knew he would be coming home with me. At first glance, most people would have seen what was left of a severely infected eye paired with an empty eye socket. I, however, saw a bundle of courage, happiness and positivity. Stevie immediately began to purr and knead while always curiously exploring the endless abyss surrounding him. 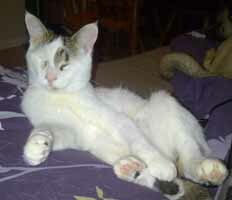 Stevie’s remaining eye was surgically removed and both of his eye sockets were sutured closed. Although he cannot physically see the world around him, Stevie’s outlook is both fascinating and inspiring. If I were in his position, I don’t think I would be strong enough to have such an undefeated spirit. As Stevie’s story spread, a lot of the same questions arose. Wouldn’t it be more humane to euthanize? How does he get around? Can he find his food and litter box? The truth is, Stevie is probably one of the happiest little critters I know! He finds his food and litter with ease and, from afar, most onlookers would never know he is blind. I am proud to say that Stevie has made a wonderful addition to my family. He gets along great with his brothers Mick (the cat) and Jagger (the dog). They play and interact together day and night. I have often caught Mick grooming Stevie and they both love playing with their favourite crinkle puff toy (generously donated to them from Helen from Animal Welfare). Stevie will forever be my little wonder cat!